This one is so neat! 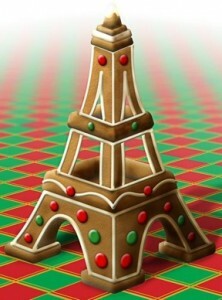 The Eiffel Tower made out of Gingerbread Bread and decorated simply with only red and green icing or M&Ms. It would also be really fun to make the Eiffel Tower super shiny as if it were all lit up at night with millions of lights and this could easily be achieved once your base Eiffel Tower was created as you could decorate it with edible glitter, sanding sugar or edible silver beads or “dragees”. Its up to you and you can get as creative as you like, maybe you are skilled enough to create one of the two restaurants in the tower- Altitude 95 or Jules Verne the Michelin Star restaurant! “j’aime Paris” I love Paris. Was just watching the movie Sabrina from 1954 with Humphrey Bogart and Audrey Hepburn on iTunes… remember her life altering trip to Paris?